North Western�s 237 (CDB 237), a 1949 Leyland PD2/1 with Leyland L53R bodywork, is seen awaiting departure for Macclesfield in the middle lane of the western roadway. Behind it is the main building of the bus station, and in the background the enormous train-shed of Central Station. The roof of the shelter for stands 10-17 is visible above the Weymann Hermes single-decker behind the PD2. Whatever Londoners may try to tell you, the British bus industry began in Manchester. The Greenwood company started its horse-bus service (from the Salford district of Pendleton to Manchester city centre) in 1824, a full five years before Shillibeer�s operation in the capital. In that pre-railway age public transport was limited to a small number of excruciatingly slow boat services along shorelines, canals, and navigable rivers, and horse-drawn stagecoach services which ran (again at a very slow speed) on long distance routes between inland communities. Both forms of transport were effectively killed off by the growing railway network over the following three decades, but the simultaneous growth of cities and industrial towns gave budding entrepreneurs more opportunities to invest in road transport. Greenwood and his kin around the country survived this revolution as they were already focused on shorter-length services in urban areas. It was to be a brief reprieve as electric tramways were developed towards the end of the 19th century and obliterated their horse-bus competitors. In most cases these tramways were operated by local municipalities, and having made an enormous investment in their tramway networks councillors were determined to protect them from competition in the early 20th century by the new motor-bus companies. This attitude was certainly prevalent in Manchester where the corporation refused to licence any motor-bus services within the city boundaries, except their own of course, preferring that companies such as North Western (to the south) and Ribble (to the north) offer connections from the city�s outer tram termini. The general strike of 1926 changed all that as a plethora of small independents invaded the city to offer an alternative to strike-bound railways and trams. Most of these new services (such as those of Tognarelli from Bolton and Chadderton, Goodfellow from Hyde and Wilmslow, and Sharp from Monton and Poynton) ran on a �return ticket� basis, operating to and from private land in Manchester city centre and selling no tickets within the city�s boundaries, thereby avoiding the need for a fruitless application for a Manchester licence. The Rochdale Canal Company�s yard (on Lena Street, a short walk from Piccadilly) was particularly popular as a terminus for such services. The strike soon ended but the new operators had no intention of giving up their lucrative routes into Manchester. North Western and Ribble were as annoyed as the corporation by this phenomenon and started to make their own plans to cross the city�s borders. The councillors were forced to change their position on such transgressions and decided to come out fighting. In April 1927 Manchester Corporation organised the �Co-ordinated Motor Bus Scheme�, an elaborate network of limited stop routes which were jointly operated with other municipalities. The original operators of this network included Manchester, Ashton-under-Lyne, Bolton, Bury, Oldham, Rochdale, Salford, and Stockport, along with the independent company Lancashire United which served many of the smaller South Lancashire towns such as Atherton, Farnworth, Swinton, and Tyldesley. By the end of 1927 a total of twelve express routes were in operation and Manchester city council saw the obvious advantage of adding services from areas dominated by other municipal and �area agreement� operators. The corporations of Leigh, Ramsbottom, and Rawtenstall were signed up (although the latter two offered connections outside the city boundary) along with the S.H.M.D. Joint Board and � although in a slightly different way � North Western and Ribble. As fellow subsidiaries of the gigantic British Electric Traction group it was only natural that North Western and Ribble would cooperate when they were finally welcomed in from the cold. In late 1927 they formed a jointly owned offshoot, Omnibus Stations Ltd, and invested �12,500 each. The vast bulk of this capital, �24,000, was spent on the acquisition of a site for a new bus terminus at Lower Mosley Street, in the shadow of the train shed of Manchester (Central) Station. On 1st March 1928 the new bus station opened, although at that time it was little more than a piece of ground with no facilities on site. North Western�s services from Buxton, Hayfield, Macclesfield, Bramhall, Poynton, Romiley, Northwich, Warrington, and Knutsford were extended from their previous inner termini at the tramway�s edges to Lower Mosley Street from that date and allocated the Manchester Corporation numbers 27, 28, 29/30, 31, 32, 33/34, 36, 37, and 38/39 respectively (the number 35 was already in use). Despite the �corpy� route numbers, Manchester�s own vehicles never operated on most of these services which ran �by arrangement�. The arrangement in question involved the North Western buses running as if on hire to the corporation and paying over all receipts from fares gathered on Manchester mileage to the municipality less an allowance for the operating expenses involved. Besides these �by arrangement� routes, North Western also became a fully-fledged participant in the original �Co-ordinated Motor Bus Scheme�, contributing its existing services from the Glossop, Oldham, and Urmston areas to the municipal pool. In some cases these routes were combined with those of other participants to produce cross-city services such as the 3 (Bacup-Rochdale-Manchester-Urmston-Flixton) and the 6 (Glossop-Stalybridge-Ashton-Manchester-Chorlton). Other �Co-ordinated� routes terminated at Lower Mosley Street, including those from Oldham and beyond (10/13/14) and Urmston (11/12), adding to the activity at the new bus station. Ribble, by contrast, remained slightly aloof from the �Co-ordinated� pooling arrangement, but took advantage of the new atmosphere of detente by introducing express services from Lower Mosley Street to Lancashire towns such as Burnley (via Rawtenstall), Clitheroe (via Accrington), and Preston (via Chorley). From May 1928 the Preston route was extended to Blackpool twice daily as the �EX1� and North Western began its own once-daily service to Blackpool (which had the advantage of operating virtually non-stop) from the same date. Returns on the two operators� Blackpool services were spectacularly good and in July 1928 they began a joint operation via Chorley and Preston on a half-hourly basis. Lancashire United was invited to participate in this new service, partly out of politeness but mainly because North Western had been refused a licence by Bolton Corporation who had never heard of them and saw no reason to let a Cheshire-based company earn revenue from a route entirely within Lancashire. The solution was for three (North Western operated) journeys a day to avoid Bolton and run via Westhoughton instead on an existing Lancashire United licence. Meanwhile Lancashire United�s vehicles ran through Bolton where they were a known quantity and had no problems with securing a licence. National licensing, when it came in 1930/31, eliminated the need for this subterfuge and vehicles of all three operators began to run via both Bolton (the X60) and Westhoughton (the X70). The summer frequency for these 60-mile long routes was later increased to every 15 minutes. In 1947 Ribble took delivery of a batch of Leyland PD1As with lowbridge Brush bodywork. This proved less durable than the chassis and in 1955 the entire batch was rebodied by Burlingham as illustrated here by fleet number 2492 (BCK 435). Further improvements came in 1958 when the vehicles original engines were replaced with Leyland O.600 units, which arguably turned them into PD2s. 2492 is on an X60 with the Blackpool shelter behind it. 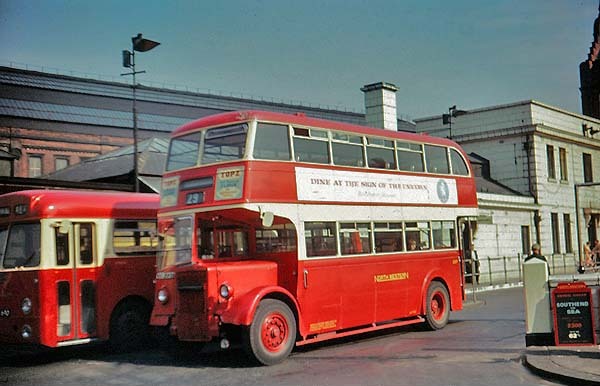 To the right is Isherwoods garage with an all-Leyland Royal Tiger of Ribble, a North Western PD2/21, and a Manchester Corporation double-decker identifiable on the car park. By the beginning of 1929 Omnibus Stations Ltd�s share capital had been increased to �35,000 by inviting other companies (mostly B.E.T. subsidiaries) to participate. These included Yorkshire Woollen (�2,500), Midland Red (�2,000), Barnsley and District � the future Yorkshire Traction (�1,000), Northern General (�500), Potteries � later PMT (�500), Trent (�500), and Wrexham & District � then owned by B.E.T. but later absorbed into Crosville (�500). In addition the Tilling Group subsidiary Harrogate Road Car Co � later West Yorkshire � contributed a further �2,500 to establish its own right of access to the new bus station. The extra funds were used to accelerate the building programme on the site, as the profusion of new services had already tested the original structure on Lower Mosley Street to breaking point and beyond. Things were destined to become even more hectic as May 1929 saw the introduction of new North Western express services to Barnsley (via both Holmfirth and Woodhead), Bradford via (Halifax), Derby, Liverpool, Newcastle-upon-Tyne (via Leeds), Nottingham, and Sheffield (via both Glossop and Castleton). All of these routes except those to Sheffield (joint with Sheffield Corporation) were jointly operated with fellow Omnibus Stations Ltd shareholders while the �Limited Stop Pool� service from Liverpool and Manchester to Leeds and Newcastle (with a spur to Hull) also featured participation by the newly created B.E.T. subsidiary East Yorkshire and the notionally independent Lancashire United (which had several shareholders in common with the B.E.T. group). London was finally added to the list of destinations served from Lower Mosley Street in August 1929 when North Western and Midland Red began a daily joint service on the route via Birmingham. The journey time was then just over 10 hours. At least five independent operators were already running between Manchester and London, among them Enniway (of Manchester), Majestic (of London and Manchester), Palanquin Coaches (of London), Tognarelli (from Bolton via Manchester), and Yelloway of Rochdale (from Blackpool via Manchester). Tognarelli�s London service came to an end in December 1929 when his business was jointly acquired by several members of the �Co-ordinated Motor Bus Scheme�, among them North Western which took the express service to London along with a share in the local route from Manchester to Chadderton. The reduction in competition was short-lived however, as Finglands Garage filled the void by starting their own route to London. In its way this was more annoying than the Tognarelli route as it departed from Finglands� new coach station on Great Bridgewater Street � directly across the road from Lower Mosley Street Bus Station. While the new express services which commenced in 1929 had been (in the main) to large cities and towns, the new routes in 1930 were seasonal runs to resort towns such as Llandudno, Scarborough, and Southport. Surprisingly, perhaps, these were all operated by North Western alone despite running through the territory of other �area agreement� companies which might have been expected to demand a share. As business boomed the new building programme progressed, although always lagging behind demand. The �Blackpool Shelter� on the Calder Street side of the bus station was completed in the Spring of 1930 and an island platform was installed in the centre of the original site soon afterwards to provide intending passengers with some protection from the travelling hardware hurtling around their ears. On the Lower Mosley Street side the original building was extended southwards in the Spring of 1931 by the addition of a sizeable passenger shelter which claimed to serve stands 10-17 although this platform had room for four vehicles at best. Each service had its own queue as a result, if not its own parking space. There was still insufficient room, an inevitable side-effect of the bus station�s continuing growth. As a result many of the local services (particularly those from the Oldham, Stockport, and Urmston areas) along with the longer runs to Knutsford, Northwich, and Warrington were transferred to other facilities (mainly the corporation bus station at Parker Street) during 1931 to relieve the pressure. Further changes were to take place during that year. 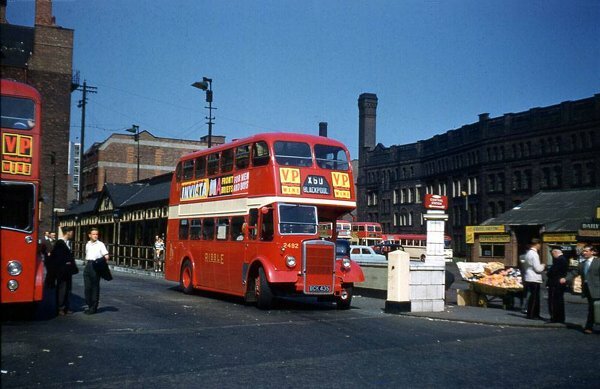 Manchester�s police had become increasingly concerned at the gridlocked traffic congestion around Market Street and Piccadilly where high-frequency tram services mingled with the equally high-frequency cross-city routes of the �Co-ordinated Motor Bus Scheme�. They demanded that the cross-city bus services be split in two with each half terminating at peripheral sites on either side of the congested area. Local travellers lost an invaluable facility after only four years but Manchester�s councillors were apparently more afraid of the police than of voters. The dismemberment of the �Co-ordinated� routes began in October 1931 and Lower Mosley Street gained yet another local service as a result. The number 6 from Glossop, Stalybridge, and Ashton (jointly operated by North Western, Manchester, Ashton-under-Lyne, and S.H.M.D.) lost its southern extension to Chorlton in 1933 and became a familiar site at its new terminus on stand 4 at the rear of the new �island� platform at Lower Mosley Street. This seemed to be a particularly pointless change as service 6 vehicles still traversed the area of the most severe congestion in the city centre. In addition Manchester continued to operate a curtailed cross-city version as their service 86, if only at a vastly reduced schedule. From 1935 passengers waiting for the number 6 to Glossop had a roof over their heads after the completion of a large shelter on the �island� platform. A more significant expansion of the Lower Mosley Street site came in the following year. North Western�s rivals on the Manchester to London service had been reduced in number by the withdrawal of both Enniway and Palanquin by 1931 and by North Western and Midland Red�s joint acquisition of Majestic in 1933. In 1936 Finglands� London service was acquired by North Western while their rather grand coach station on Great Bridgewater Street was acquired by Omnibus Stations Ltd. The coach station�s booking hall and offices were later to become the Golden Horse Cafe while the small garage at the rear would become Ribble�s Manchester depot. Incidentally you might have read elsewhere that Ribble�s garage here had room for just a single coach. This is one of those ridiculous statements that seem to be repeated ad nauseam without being questioned. From personal observation I can assure you that up to six 30-foot long coaches would fit inside. Not easily given the narrowness of the access road, but they would fit!